I thought I was prepared. I had my cute little stash of cloth diapers, wipes and diaper rash cream. I had a closet full of adorable pink outfits and drawers full of soft cuddly blankets. I had big stuffy pillows on the rocker for feeding time, and a cupboard full of pre-washed bottles. I had my hospital bags packed and 4 copies of my birth plan on standby. I was already a good mother as far as I was concerned! I soon discovered that no one can prepare you for the reality of motherhood. So for all you new moms or moms to be, here's a little recap of the things no one could have prepared me for...just to give you a heads up. *I received a whole new set of emotions the minute I laid eyes on my baby girl. It's a whole new kind of love. Sometimes I love her so much that it hurts. That love also brought a lot of fear into my life. Fear of my baby getting hurt. Fear of losing her. I had nightmares about it. I was not prepared for how much I would have to trust God with my baby. *As a mom, I never knew how much I would second guess myself. I have come to learn that there are no black and white rules when it comes to mothering. You have to trust your gut. Read my post on Attachment Parenting and Babywise here. *I have re-fallen in love with my hubby for things I never thought I would find attractive. Seeing him change a diaper, sing sweet pea a song, fly her around the room, or read a silly children's book makes my heart smile. He is such a good dad! *I have already made mistakes as a parent. I feel guilty for things I didn't do, or could have done better. But a sweet smile or slobbery kiss from my sweet baby reminds me that she's not holding grudges and still wants me for her mommy. *Babies cry. Even ones that are well taken care of! For some reason I thought that my baby was going to be the exception to that. *No one could have prepared me for how happy I would be staying home with sweet pea. I was worried I would be bored, or just get tired of doing the same thing every day. I love the memories I get to make with her everyday. I never knew that I could look forward to being woken up at 3AM because I got to feed and snuggle my baby. I never knew I would be just fine not going to a party because it meant a quiet evening with my hubby and baby. I never knew how I would love changing a diaper because of the smiles and giggles I received in return. 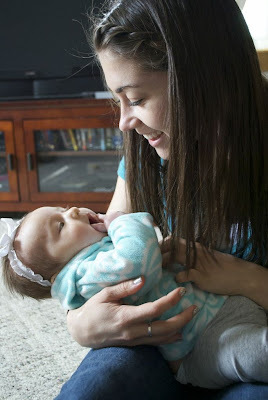 I had no idea how much my baby was going to change my life... and make it so much sweeter! What surprised you about being a mom? Just found your blog on FB through a friend who posted the link. I just found out that I'm pregnant a few weeks ago and this was really encouraging. I know the enemy will try to let fear control me and miss out enjoying this experience, but I refuse! God bless you and your family. I can so relate with everything you said! Hi Faith! I'm finding myself reading your blog more & more...it's so sweet and true. I enjoyed this post on motherhood & it's MANY surprises, I hear that ha! Hope to connect with you more! This will be my first mother's day as a mom. Sadly, a few months ago we lost our precious child through miscarriage and will never get to hold that baby in our arms on earth. Despite the circumstance, that baby made me a mom. It is amazing how quickly you can be attached to someone so tiny. How the little bean on an ultrasound can make you feel so willing to do anything for that little life, to love unconditionally and to protect and care beyond what you ever imagined. Someday, I hope to experience the other sides of motherhood. It is so beautiful. Happy mother's day ladies, to those wishing for children, for those with babies in heaven, to those pregnant and those holding their babies in their arms! This is so sweet!! And I feel exactly the same! Everyone tells you about how hard it is and how much sleep you're not going to get! 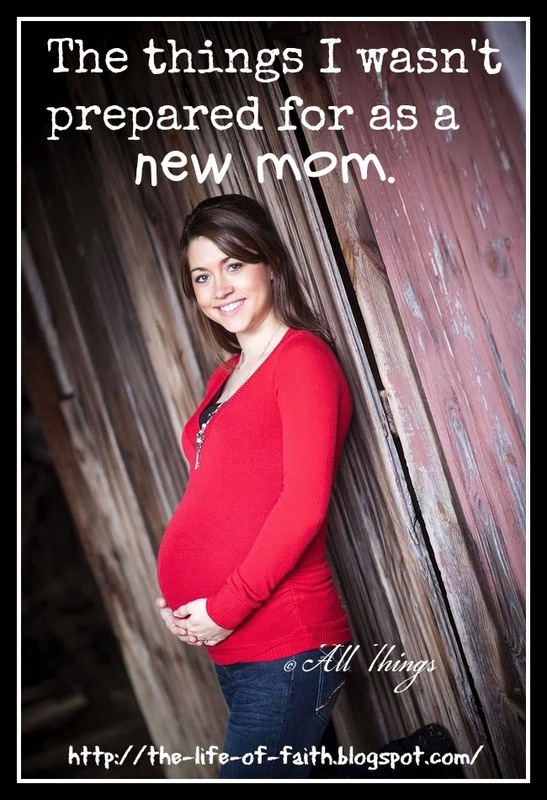 When new Mom's or Moms-to-be ask me, I skip the pity me stuff and say it's fun!! No one ever told me how much fun it is!! Aw, I love it! I'm always surprised at how little I know about mothering this little girl. One day something will work, the next it won't. She constantly keeps me guessing, but I'm loving every minute she has me working for it! Precious. Noone can never teach you any of those things. You learn them on your on and over the years you have your baby with you! I'm not a parent or a mother although I've been one before to another person's child. and I know it's gonna be different when I have my own kids. Lovely post. My son is just 20 days old. I'm with you on the worry part. I just bathe my son in prayer every day and *try* to trust God. Love this post! Can't wait to meet my little Bean in a month, but I am definitely not feeling prepared! This is a great post! I don't think anyone can really prepare you for motherhood until you do it yourself. But there are lots of great things we all must learn along the way! I'm featuring this tonight at my link party and pinning! Faith, I love how you write and can express yourself so that we can imagine your feelings and see them as our own. Now that I am a grandmother, I have the feelings for my own babies having babies and for how I can be a positive influence on my grandchildren's lives. I also love being a part of your life through this blog.